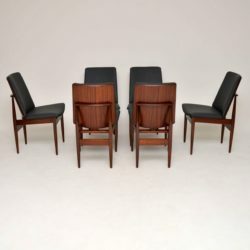 A smart and stylish set of vintage teak dining chairs, these were made in Denmark, they date from the 1960’s. 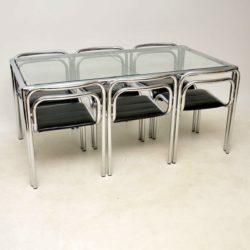 The condition is excellent for their age, the frames are all clean and sturdy, with only some minor surface wear here and there. The black vinyl upholstery is all clean and intact with no damage to be seen. 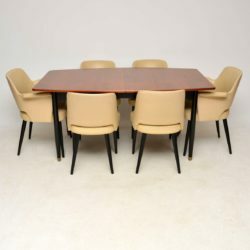 A stylish and very comfortable set of ten vintage dining chairs, made in Italy, these date from the 1960-70’s. 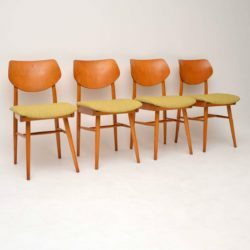 There are six in brown leather, four in black leather, they are all in good vintage condition. 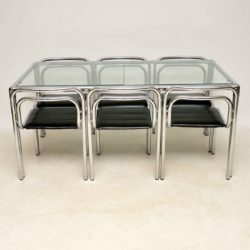 There is some light surface wear here and there, the leather is all intact with nice patina, the frames are sturdy and sound with a few marks here and there consistent with age. 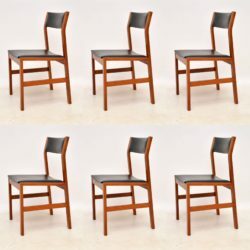 A beautiful and extremely well made set of six solid rosewood dining chairs, designed by the master of Danish dining chairs, Niels Moller. 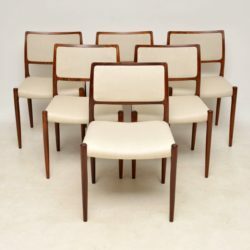 We have had these stripped and re-polished to a very high standard, and we’ve had them completely re-upholstered in a lovely cream fabric; the condition is superb throughout. 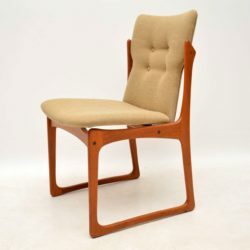 The construction is top quality, they have stunning grain patterns, they are all sturdy, sound and are very comfortable. 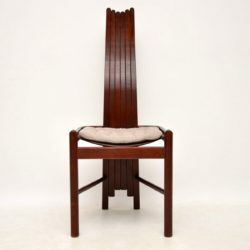 The Moller stamp is seen beneath each chair base. 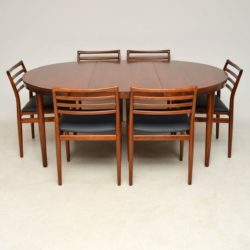 A beautiful and very comfortable set of six rosewood dining chairs, these were made in Denmark by Dyrlund, they date from the 1960-70’s. They’re in good condition for their age, all the frames are clean, sturdy and sound. 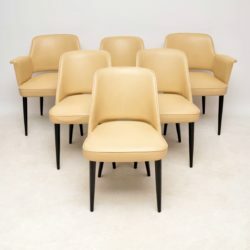 The seats were recently upholstered by the previous owners less than a year ago, they are all clean and in great condition. 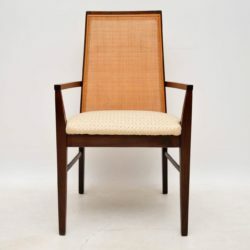 The caned backs are mostly in very good condition as well, there are just a few extremely tiny areas of damage, the most noticeable are seen in the close up images. 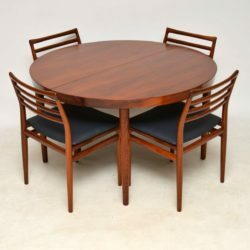 A beautiful set of sculptural Danish dining chairs in solid teak, these were made by Vamdrup Stolefabrik, they date from 1960’s. 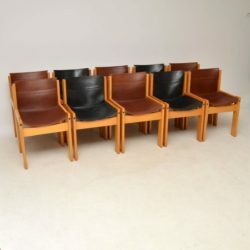 They are in great condition for their age, the original fabric is mostly very clean, there is just some very light wear on a couple of the seats, seen in the images and barely noticeable. 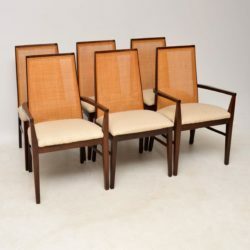 The solid teak frames are all clean, sturdy and sound. 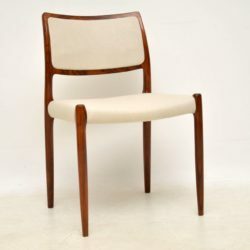 A very stylish and unusually designed set of vintage dining chairs, made from stained beech, these date from the 1970’s. They’re very comfortable and supportive, we have had the seat cushions newly made and upholstered in a light grey fabric. They are in lovely condition for their age, they are all clean, sturdy and sound, with just some minor wear here and there. There are a couple of tiny nicks to the edges of two seats, barely noticeable in real life and seen in the close up images. 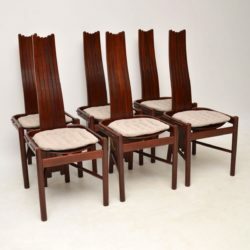 A stunning and very comfortable set of vintage Danish dining chairs, beautifully made from rosewood. 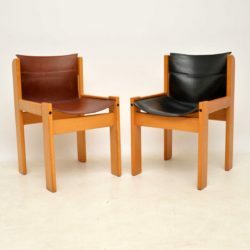 These date from the 1960’s, they have been fully restored and are in superb condition throughout. We have had the rosewood frames stripped and re-polished to a very high standard, the colour and grain patterns are gorgeous. 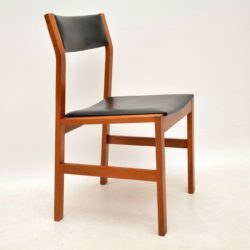 We have also had these fully re-upholstered in a top quality black vinyl that looks and feels just like leather. The design is really spectacular, these look especially good from behind, which is how they would be viewed most of the time. 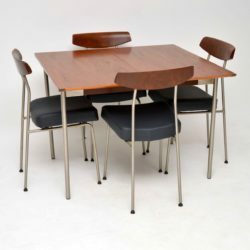 A beautifully made and very stylish vintage dining table and chairs in teak and steel, these were designed by John & Sylvia Reid for Stag furniture’s S range, they date from the 1950’s. 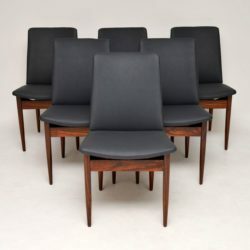 We have had the teak table top and chair backs fully stripped and re-polished, the chair seats have been newly re-upholstered in black vinyl; the condition is superb throughout. 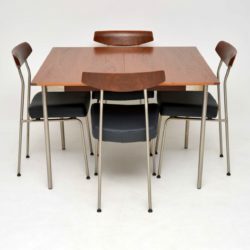 There is an additional leaf that comes with this to extend the dining table, it slides under the table top to be stored away when not in use. 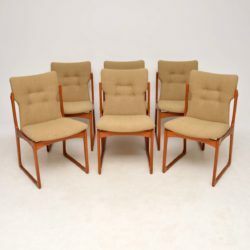 A beautifully designed and rarely seen set of four vintage dining chairs, these were made in Czechoslovakia in the 1960’s by Ton. 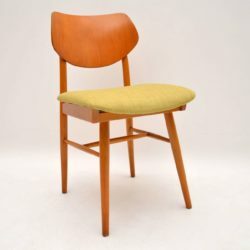 they are in great condition for their age, they are all clean, sturdy and sound, the seats have all been fully re-upholstered in our light green fabric. There is just some extremely minor surface wear to the wood here and there. These have a great look from all angles, they are very comfortable and supportive.